When I went to Zimbabwe in 2004, it was to be for some two years. There were few resources on former Rhodesia on the web and I toyed with the idea of building a useful online platform. Specifically, what seemed to be lacking, was a good portal. So, in the few days before heading south, I threw together a very reasonable portal on all things Zimbabwean and called it inZIM.com. Technically, the portal leaned heavily on work by DUware, although I found the code of their CMS/portal rather buggy to start with. 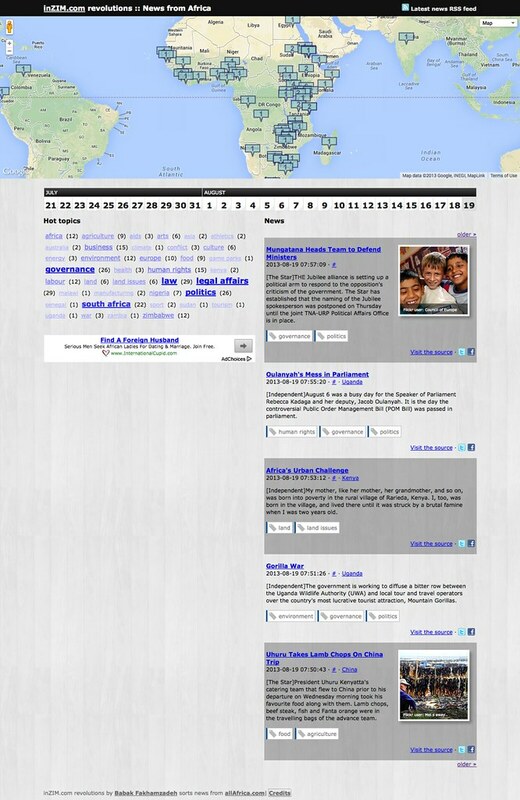 In early 2006, it was time to completely overhaul inZIM.com. Though many visitors stopped by, few contributors participated actually participated. I threw out the concept of the portal and had the site focus on African news, photos and weather forecasts. The site was rebranded as inZIM.com reloaded. The news was sourced from allAfrica.com, with pictures coming from Flickr. In early 2011, after some inspiration triggered by browsing the excellent projects of the guys over at MapBox, I updated the site yet again. Specifically their interesting Managing News application spurned my interest, in part tipped off by a friend, in part after having a chat with a Dutch web developer in Uganda. 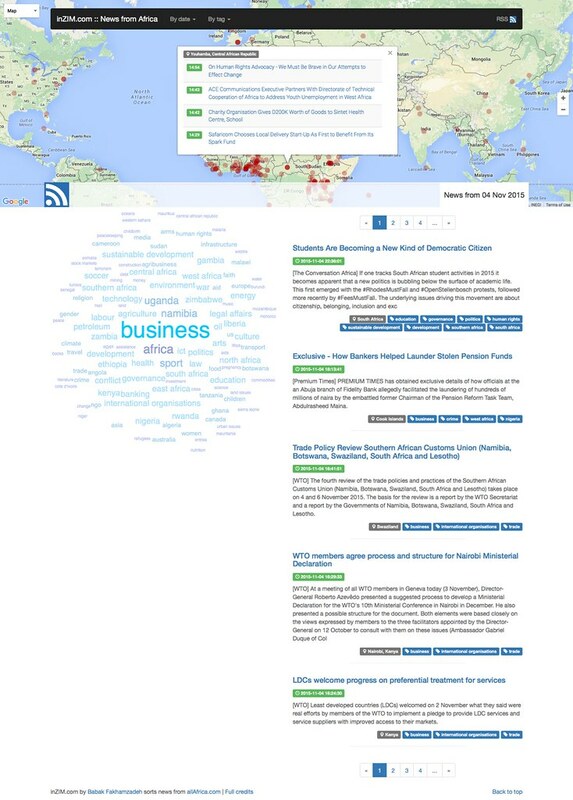 Managing News is essentially an RSS-based news aggregator which plots incoming news on a map. I installed it, learned that it is based on Drupal, and found that, though rather pretty to look at, was also a tad slow. What was more, Managing News didn’t do two things I think are essential for an application like this. It didn’t recognize the locations in geoRSS feeds and it didn’t recognize duplicate items sourced from individual RSS feeds. So, I decided to throw together a similar setup, coded by hand in PHP and jQuery, with a MySQL backend and use it to replace inZIM.com. The, again, rebranded inZIM.com revolutions still serves up news form Africa, coming in through the plethora of RSS feeds available from allAfrica.com. RSS imports are done using Magpie and RSS to geoRSS conversion is done through a Geonames service, from where I also source individual place names. The map is, of course, Google Maps. The functionality of the new inZIM is essentially the same as what I’ve built several times in the past few years for a couple of clients in the health industry. There, too, multiple information sources were trawled, filtered, and then displayed on a Google map. However, as the variety of news sources for these clients was significant, a little bit of overhead, content administration, was required to optimize those systems’ output. Sadly, with that content administration lacking, my clients not taking the time, really, those services weren’t able to add value to their users. inZIM.com revolutions is different, in that all the news is already coming from a highly targeted source where extensive selecting and editing is already done before the articles are sent out into the world, meaning the quality of the content will be better by design, requiring less outside interference to optimize the information displayed. In March 2011, inZIM.com was nominated for the World Summit Award Global Contest as the best e-Content example in e-Science & Technology from Uganda. In August 2013, I partook in a MOOC called Maps and the Geospatial Revolution. For the course’s final project, I extended inZIM revolutions to provide a historical view of news plotted on the map of Africa. With this, it’s now possible to see the focus of the world’s attention shift from one day to the next, creating a historical narrative of news on and from Africa. The one obvious conclusion is that, even during the unrest in Egypt, AllAfrica’s news sources still predominantly focus on sub-saharan Africa. Additionally, the individual news articles are, where possible, matched with Flickr photos through their tags and locations. The biggest issue I had to resolve (and of which I’m not totally sure it now has been) was the seemingly inconsistent character encodings of the news stories and locations that were pulled in through the different services. 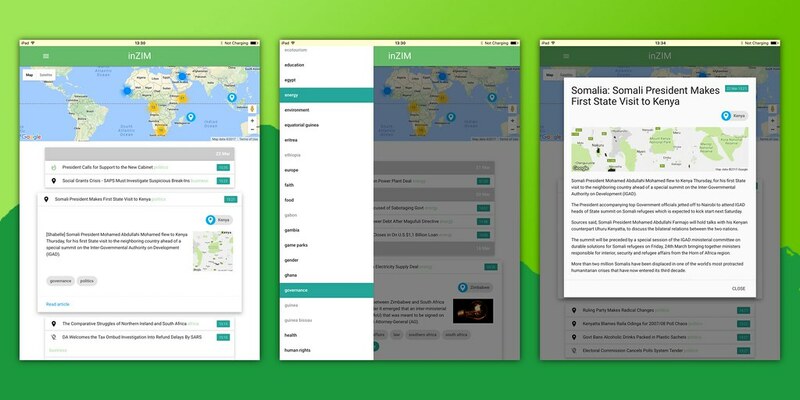 In November 2015, I streamlined much of the website in preperation for a mobile app I intend to build, serving the news available through inZIM.com. In December 2015, the app became available on the iOS app store. In March 2017, inZIM.com was rebuilt using Materialize, a front-end framework inspired by Google’s Material Design philosophy.